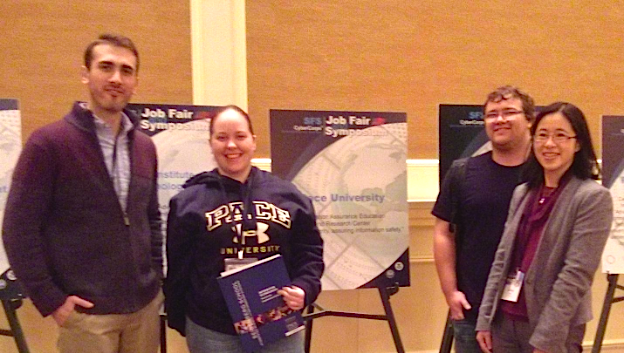 Seidenberg students and cybersecurity scholars Cynthia Shaw (BS/IT ’15), Anthony Martini (MS/CS ’16), and Luke Babak (BS/IT ’14) traveled to Washington DC in mid-January to attend the CyberCorps®: Scholarship for Service (SFS) Job Fair. The annual event is an opportunity for students in the SFS cybersecurity scholarship program to meet and network with federal employers with the scope of securing an internship or permanent position. The students had the chance to interact with representatives from over 40 federal agencies, and it is expected that they will get to parse through some interesting offers in the months to come. Seidenberg’s own SFS alum, Christopher White ’13, ’14, a Cyber Security Engineer with the Johns Hopkins – Applied Physics Lab, was one of the four alums to speak in the SFS Job Fair Alumni Panel. So very proud of all of you! Pictured from left to right: Anthony Martini (MS/IT ’16), Cynthia Shaw (BS/IT ’15), Luke Babak (BS/IT ’14), and Li-Chiou Chen, Professor, IT WEST Department Chair and Cybersecurity Scholarship Program Director. Previous Previous post: Zakiya Sims is on a mission to grow PCS! Next Next post: The Answers to the Burning Question: What is a Shmoo?